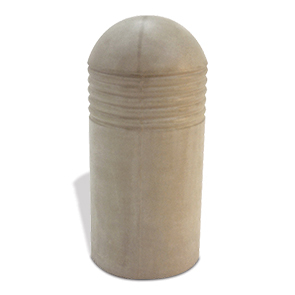 Safeguard areas and control traffic flow are duties well suited for these concrete security bollard. Naturally inert, resilient and timeless, concrete is built ready for high volume traffic and in a wide range of all-weather conditions. The featured reveal bands help increase in the bollard's visibility, adding dimension that catches eye-flow. The concrete construction is dually reinforced with 1/4" and 3/8" steel rebar for heavy duty strength, durability and performance. Standard and premium finishes are available.